It is a brave man who launches a new company in the current economic climate, especially if he is competing with the far east in the manufacture and distribution of small amplifiers. Matteo Malguzzi is such a man. 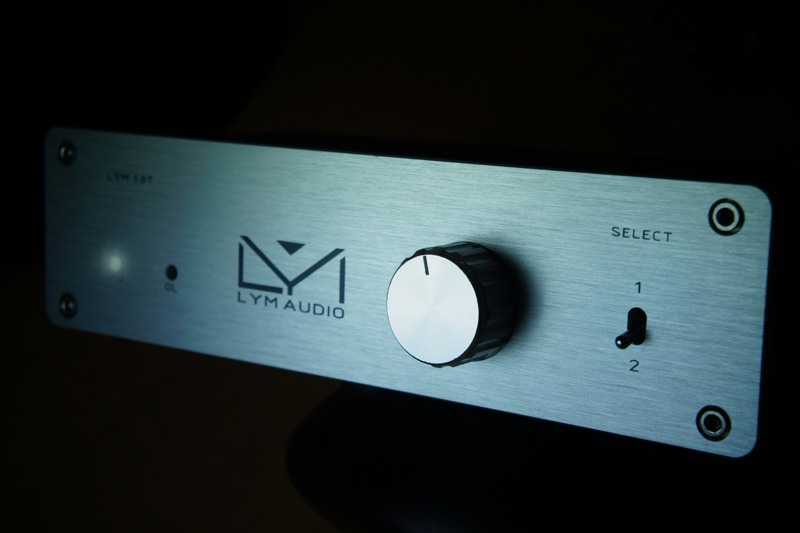 Lym Audio is his vehicle for building and selling a new Class D amplifier – a T-Amp essentially. His intention is to differentiate his amplifier through the quality of the circuit design and execution. Matteo says: "We designed the LYM 1.0T for be the best T-amp on the market right now". This claim caught my eye as I've long been a fan of the original Sonic Impact T-Amp, having at one time used three of them simultaneously to drive three way speakers. So I was keen to see what could be done with the same technology taken up a notch in terms of all aspects of production. The circuitry is housed in a black metal case set on four rounded, good quality, silicone feet and faced with an aluminium plate 4mm thick. The case is 19cm wide, just under 10cm deep and 5.5cm tall. Because it's made of metal it's fairly sturdy although it's light enough that it can still be fairly easily pulled over by the weight of speaker cables. The amp is equipped with proper speaker binding posts of decent quality and will take banana plugs, spades or bare wires. A "laptop" type switched power supply was supplied with the review model, rated at 19v 3.42A, although this is a 20 euro option with a power cable if required. 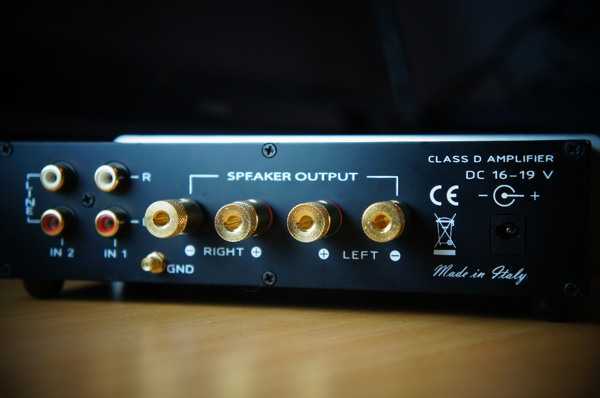 The amplifier is made in Italy. The front panel sports a switch to select between the two inputs, a volume control which also operates as an on-off switch, power lamp and an overload indicator light. No remote control is available. The overload indicator is a useful addition as it shows the onset of distortion thereby allowing the volume to be set at an optimal level. Circuitry is neatly laid out and well soldered. 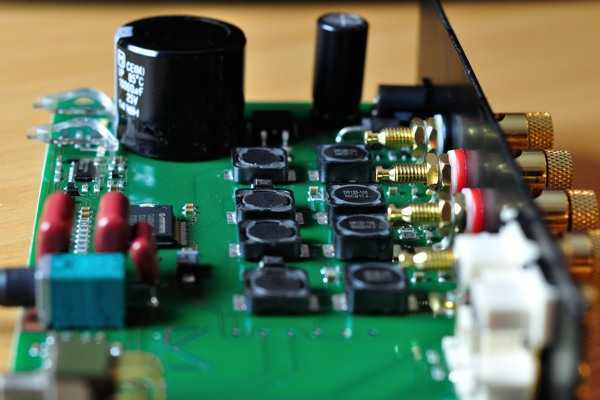 In technical notes supplied with the review sample, Lym stress the importance of using surface mounted components and a carefully designed printed circuit board to reduce interference between the different sections of the amplifier and manage the distribution of earth currents. A two stage filter is used to reconstruct the audio from the pulse wave modulation signal, with benefits claimed over simpler, single stage, implementations. Benefits are also claimed for the internal voltage regulator which takes any switched mode supply rated between 16 and 19v with a minimum of 2.5 amps. The supply circuitry converts the input to a stabilised 13.8v supply internally. I did query whether it would be beneficial to use an independent regulated 13.8 supply as I had one to hand that I had used with my Sonic Impact amps, but was cautioned against this as the higher voltage is need by the regulator circuit. The chip is a Tripath TA2024C, one of the chips regularly used in this type of amp. Two types of capacitor are used in the construction. A large, high capacity electrolytic sits at the output of the regulator circuit. This provides a reservoir allowing the amplifier to meet high, short term power demands, thereby delivering better dynamics. Finally a high quality metalized polypropylene capacitor is used to decouple the chip from the sound source. The quality of the capacitor is claimed to reduce noise and unwanted harmonic distortion. Overall output power is around 10W into 8 ohms, rising to 17W into 4ohms. The little amp sat in my office system for several weeks so it was thoroughly burned in before I ran some of my favourite albums through it. Reviewing amps can be difficult. It's not like a digital source where you can switch between two or more of them to allow quick A/B comparisons. But the good thing is that there are often bigger differences between ostensibly similar amps than there are between digital sources. So although it was more difficult to pin down the detailed differences, the overall effect when I took out the Lym and replaced it with an original Sonic Impact T-Amp was pretty striking. My immediate impression was that it was a change for the worst. The Sonic Impact sounded harsh and strained by comparison. I'd expected to hear a difference but this was more than I'd anticipated. Then in one session I played a series of tracks from several genres with the Sonic Impact, noted both positive and negative impressions, switched back to the Lym and ran through them again. The review system consisted of a Windows 7 PC using an Asus Essence STX card to feed (optically) a Cambridge Audio DacMagic. Speakers were Acoustic Energy AE309s, a three way design, 91db efficient. First up was classical – represented by the 24bit 96khz recording of Mozart's Violin Concerto No. 4 in D major KV 218 from the 2L records "Nordic Sound" sampler. With the SI I noted really good imaging of violins, but perhaps a slight grating – a "digital" sound for want of a better word. The Lym was immediately more civilised. More lifelike. This was the setup that, with the KingRex UD384 playing a 384Khz file, had caused my wife (my hi-fi's harshest critic) to comment on how astonishingly lifelike the sound was. Sticking with audiophile material, next up was Rebecca Pidgeon's Spanish Harlem. This time I was struck by the sense of space served up by the original T-Amp. It exhibited good bass depth and detail. Maybe there was a little bloom around the louder vocal passages although that could be room effect. Switching to the Lym, I'm not sure it described the space behind the vocals with as much detail but the piano and the bass both benefitted from a weightier delivery. Then I fancied some deep down funky blues, so loaded up one of my favourites from Bonnie Raitt - "Love Letter" from the album "Nick of Time". The SI did OK with this but didn't really deliver the dynamic as a more powerful amp can. I also thought I noticed a slight harshness to the highs. The Lym wasn't perfect with this track either. But the kick drum in the intro was deep and the snare snapped along rather better. I tend to favour systems that deliver acoustic music and jazz but I'm not averse to a bit of noisier material now and again. So I put on a Snow Patrol single from a couple of years ago, "Chasing Cars" which starts quietly but ends up in a jangle of guitars. Nice (synth?) percussion touches weave around behind the vocals in the first, quiet verse. Then there's a long build up before the entry of the stereo guitars. The guitars came in very harshly with the older amp – although in fairness I suspect there is some unpleasant distortion on the recording. Again, with the entry of the drums and the full band the sound descends to a complete mush. With the SI, frankly I had to turn it off at that stage! The synth percussion not as evident with the Lym. It also took a little off the leading edge of the guitar. But the entry of the guitars and then the full band retained their impact without being quite as edgy and although it still sounded confused it wasn't quite as painful. Back to a more civilised sound I moved to Chan Chan from the Buena Vista Social Club album. There was a great depth of image and pinpoint location of instruments with the little Sonic Impact amp. It still amazes me that it can produce such a good sound. The Lym was similar. Highs seemed a little rolled off by comparison but there was more body and presence to the sound. Finally, I moved onto a track by The Blue Nile, "The Downtown Lights" from the album "Hats". This sets a naturally recorded voice against synthesised backing. It sounded good with the Sonic Impact, the voice singing out from the synth washes and shimmery effects. Again there was a hint of harshness and congestion. Changing to the Lym brought out the propulsive synth bass and moved the track along better. At Matteo's suggestion I tried the amplifier with less sensitive speakers than the 91db AE's. I plugged the poor little thing into my main set up to feed Usher Be-718's. These standmounts claim 87db but that's probably optimistic. Needless to say the Lym struggled and railed terribly against such treatment. The overload lamp came on when the amp was barely at half volume as it tried to feed enough current to the demanding Ushers. As I turned it up further the distortion was, as I'd expected – horrible, although at very low volumes it sounded pretty good, carrying forward the strengths I'd heard with the AEs. I'd suggest that this amplifier will struggle with speakers rated at anything much less than 90db. At around that sensitivity or above however it will go loud. I tried a loudness test with the AEs, playing a little bit of rock guitar from legend Steve Vai at levels that were as loud as I could bear in a small room. The sound stayed clean and powerful all the way up to volumes that I can't imagine anyone would want to endure in a small space. The original Sonic Impact now reminds me of a digital photograph that has been artificially sharpened by boosting the contrast at the borders between things. It's clear but it's edgy. By comparison, although conceding a fraction in terms of soundstage depth, the Lym is deliciously smooth and accurate. Lacking power and some facilities by its nature it will necessarily be limited in application but what it does, it does very well. Lack of a remote control is probably the biggest constraint, besides its relatively low output. But for a computer based system with correctly matched speakers it can serve up a very sonically satisfying recipe. Of course, the question of whether Lym has created the best T-Amp on the market remains a tricky call. Almost certainly there are other amps that I've not heard that will challenge it. Some of these may be coming out of the Far East at a lower price. What we can say for certain is that this is a very likeable and very listenable amplifier by any standards and it could do well in a crowded market.